A: Terminal 3, F concourse, right by gate 75 and the F-3 security checkpoint (that has PreCheck). Q: Can I visit there if I'm departing from another terminal? A: Absolutely. Security at SFO will let passengers departing from any concourse at SFO go through security in any concourse, even ones that aren't connected behind security. At the moment, Terminal 3 concourses E and F, and International Terminal concourse G are connected airside to the Centurion lounge. Some other concourses are connected to each other airside, but not to the point that you can walk airside to the Centurion. However, with a PreCheck security lane right next to the entrance to the lounge, it can be quite easy to clear security twice if necessary. Q: Can I visit if I'm arriving at SFO? A: It depends. If you're arriving in the aforementioned concourses E, F, or G, then absolutely. If you're arriving in one of the other concourses, then security at SFO won't let you clear into E, F, or G without a boarding pass departing SFO that day. If you're arriving internationally, again, you'd need a same-day SFO departing boarding pass to clear security. Was in the DFW Centurion lounge last week and was told that they are going to open another Centurion lounge in SFO. Not sure how much faith to put into the word of the person working the lounge reception desk but I could deal with the loss of the AA lounge if more of the Cent lounges were available. No problem accessing the AC at LAX two days ago. It's all rumors until we see an official sign in the clubs. In the meantime, perhaps AMEX and AA will work something out. Haven't heard anything about the most important detail, though -- which terminal? My guess is International or 3; in either case, no help to AA flyers. Terminal 3. Above premium security. This is huge. Even though I'm sure this is years away, this would make the Centurion network not all that much smaller than the individual DL/UA/AA networks. AA is appx 40 lounges, but that includes 2 each at ORD and JFK and 4 at DFW (i.e. the AC network is really only just more than 30 locations). If somehow they could also partner with DL to allow access even when not flying DL, they will have built an impressive product. The problem with the Centurion lounge network is that the one in the airport you use might not be convenient for flying AA. For example, the new one in SFO will be in terminal 3, which is just not worth the trouble of passing through security twice since AA flies out of terminal 2. It will actually be outside security. But, agree, not worth the trouble. Ugh. I didn't know that. All I read was that it would be on "the mezzanine level above the premium security checkpoint in United’s Terminal 3 and gate 75". Do you have a link/source? If true, that makes it inconvenient even if flying out of terminal 3 itself. You can get to every terminal at SFO behind security, so not a real big deal. I was surprised by several airports where you could't - DCA is one, and I think LGA may have been the other. I had a connection and needed to go outside into the freezing weather to take a bus. I no longer carry a jacket with me because I have left them on airplanes all over the world. 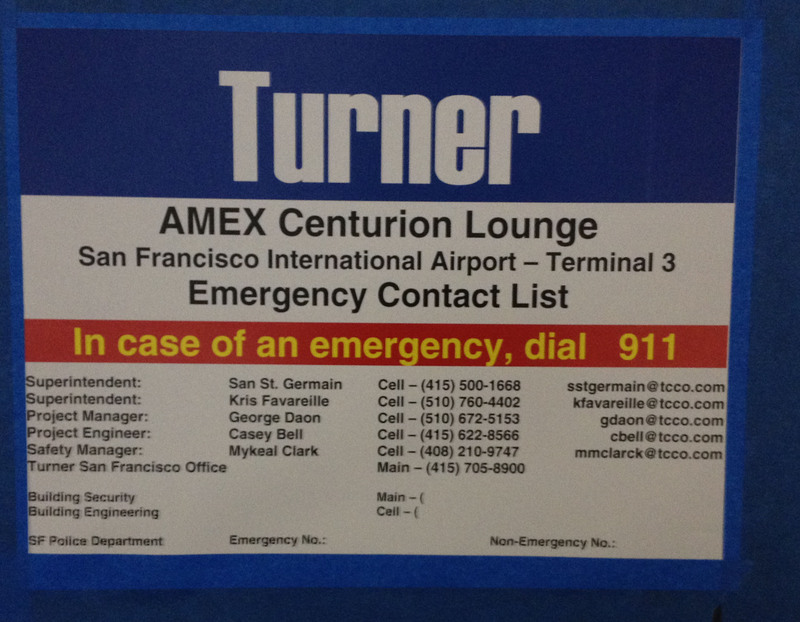 You cannot get to every terminal behind security at SFO without having to re-clear security. The terminals that are connected are: International Terminal Concourse G, Terminal 3, and temporarily via a shuttle bus Terminal 1 Concourse B.
Terminal 2, Terminal 1 Concourse C, and International Terminal Concourse A are all unconnected. More locations are coming. SFO and LGA are in the works. ...if there is an SFO lounge, . I moved your post from the LGA thread to the SFO thread. Scroll back to post #4 to see where the lounge will be located. I noticed this sign outside an area under construction on the third floor of Terminal 3. It's past subway so before security. Lots of construction work going on in that area with the conference rooms, the new security checkpoint where post-security Burger King use to be, and boarding area E opening up next week. I just hope it opens before my arrival to SFO June 18th. Just noticed today they've made one of the post security barriers go all the way up to the mezzanine level while the rest only goes one floor. Knocking out the glass barrier I suspect to add stairs/escalators? Looks like two separate construction work going on in the same area of the new checkpoint. The extra tall barrier goes right into the conference rooms.